Bus from Penang to Genting Highlands is one of the important tourist routes connecting Malaysia’s two reputable tourist attractions, Penang and Genting Highlands. Besides that, bus from Penang to Genting Highlands also provides direct bus service for Penang residents to visit Genting Highlands to spend their holiday and enjoy the cool weather. Bus from Penang to Genting Highlands is the only direct transportation with at least 1 washroom break along the journey. Shanhua Travel & Tours and GJG Express are the operators providing the bus from Penang to Genting Highlands. The bus fare for bus from Penang to Genting Highlands is at RM 42.00. The journey to Genting Highlands takes about 5 hours depending on traffic condition. There are typically 4 morning departures at 8:00am, 8:15am, 8:45am and 9:00am. Departures at night time are from 9:30pm until 11:15pm. The departure points for both Shanhua Travel and GJG are at Sungai Nibong Bus Terminal, Penang Komtar, and Jawi Toll. GJG also provides more departure points at Penang Sentral, Bukit Tambun Toll, and Jelutong Shell, while Shanhua also picks up passengers from Tambun Toll. The arrival point in Genting Highlands is either at Awana Bus Terminal, where passengers can take the cable car and spend about 10 minutes to reach Genting Highlands Resort, or at First World Hotel. Kindly note that for the cable car, only one baggage per person is allowed and if you exceed the size limit, you might have to pay up to RM20 surcharge for it. The Penang to Genting bus ticket may not meet the demand that is expected to surge after the opening of Twentieth Century Fox in 2019. 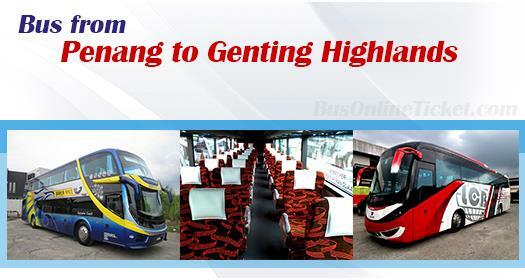 Instead of searching for Penang to Genting bus ticket from counter to counter, booking the Penang to Genting bus ticket online is hassle-free, convenient and time-saving. Besides that, secure booking environment makes BusOnlineTicket.com to be the most popular online booking portal among the customer choice throughout these years.